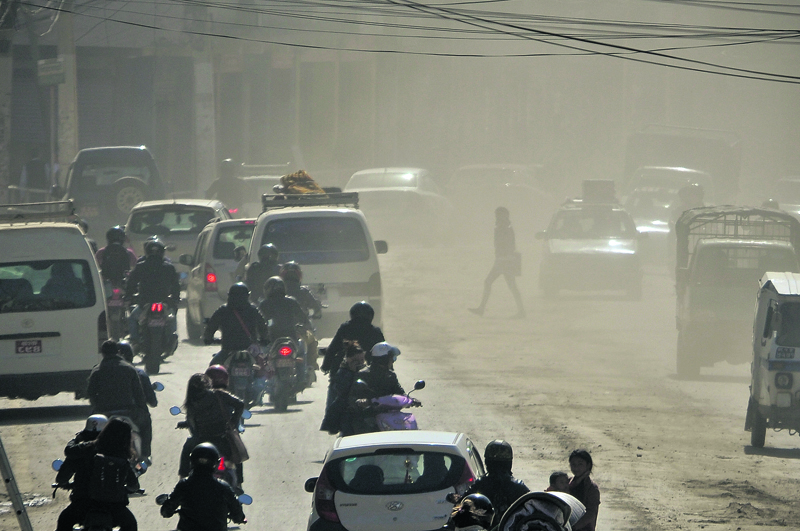 Vehicles and pedestrians along a dusty road at Lainchaur, Kathmandu on Wednesday. The ongoing pipe-laying work of the Melamchi Drinking Water Project has aggravated dust pollution in Kathmandu Valley’s roads. KATHMANDU, Feb 9: With dust pollution consistently worsening over the last couple of months and posing a serious health hazard for hundreds of thousands of people living in the capital, the agencies responsible seem to be clueless how to respond. 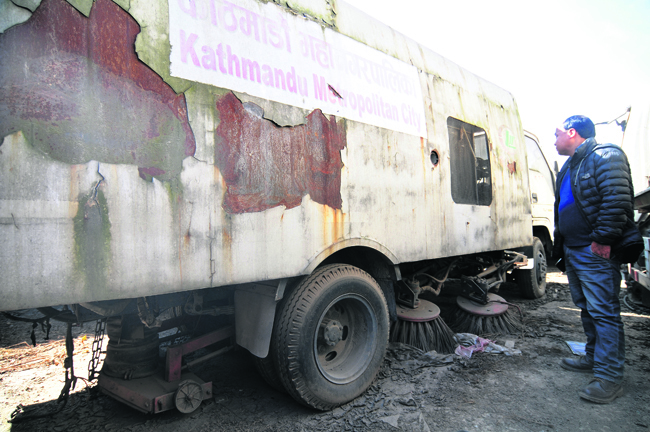 A discarded vacuum sweeper vehicle at the Kathmandu Metropolitan City office in Teku, Kathmandu pictured on Wednesday. Top officials at Kathmandu Metropolitan City (KMC) and the Department of Roads (DoR)don't have any immediate plans for easing the situation even as people across theValley are seriously worried over the alarming levels of atmospheric pollution. Officials repeat the same excuse as in the past. Measures to control the dust could not be effective due to lack of coordination among various government agencies such as the municipalities, DoR, the drinking water, sewerage and electricity authorities, the telecommunications people and others. Asked if the municipality is planning any special measures as an immediate response to the situation that has developed over the last few months, Tamang said there was no such plan. He explained that the situation in Kathmandu and other major towns can't be takled for good until and unless the cities are developed in a planned way and maintained in a coordinated fashion. He also added that the situation won't improve as long as dozens of agencies work at the same sites as per their own separate plans and schedules. 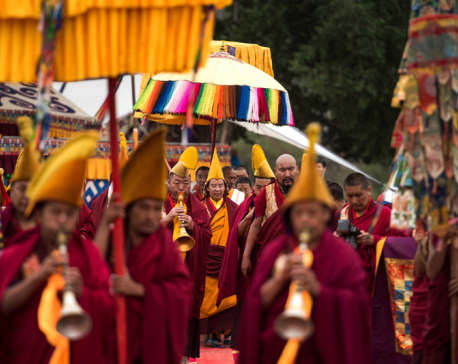 “A single powerful body must be entrusted with the task of developing a town in an integrated fashion,” he said. Tamang said the situation was compounded by the working style of the contractors and the technology they use. “Contractors here don't have modern technology and the expertise to operate in a metropolitan city. For instance, they don't even properly cover off the area where they are doing their work,” he said. Director General at DoR Devendra Karki also doesn't have any plan for providing immediate relief from the dust. He too stresses the need for effective coordination among the various agencies involved. He said that controlling the dust has became a challenge as trenches are being dug along the roads and streets in various parts of Kathmandu simultaneously. “We can't improve the situation unless various agencies such as those laying pipes, carrying out road expansion, and demolishing and constructing buildings carry out their work more speedily,” said Karki. Engineer Surya Raj Acharya, who specializes in infrastructure development, said the situation in Kathmandu worsened partly because of the working style of the contractors. 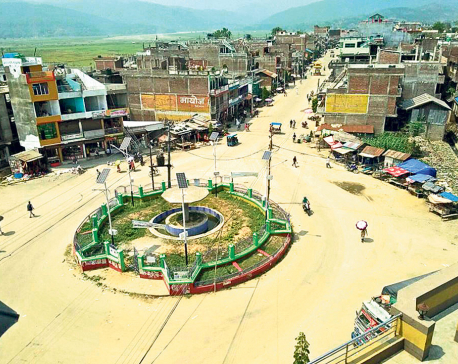 “The contractors use the same methods whether it is in a remote village or in a city like Kathmandu where hundreds of thousands have to move about near the construction sites,” he said. KMC has failed to bring its road vacuum sweepers into full operation although the dust problem in the city has become acute. Two such vacuum sweepers have remained abandoned at KMC's Teku office for more than two years because of some problem with the engines. KMC has been operating only one of the sweeper vehicles and this has failed to make any difference in the situation. Officials said they haven't been able to use the vehicles to the full because of the condition of the roads in Kathmandu. “We can't operate on rough roads and there is hardly any road section with a smooth surface,” said KMC CEO Tamang. The DoR has also been operating three sweeper vehicles but the result isn't visible. DG Karki at DoR also referred to the rough roads. However, KMC is planning to buy four more sweeper vehicles. Asked why they are buying similar vehicles though these aren't suitable for Kathmandu roads, Tamang didn't want to elaborate. It wouldn't be appropriate to comment now as KMC is about to call international tenders, he said..